Information about upcoming Life Sciences events can now be found on the Life Sciences page of our website. The page is regularly updated with both the exhibitions and conferences that the team will be attending as exhibitors or as delegates. Members of our Life Sciences team will be attending a number of events in the UK, Europe and the USA over the coming months. The team believe that attending exhibitions and conferences not only offers excellent networking opportunities, but also ensures that they are able to keep up to date with new technologies and developments within relevant industries. Dr Ruth Brown, Life Science Business Manager attended both Health GB and ELRIG Robotics & Automation 2018. The latter reaffirmed that collaborative working is a key part of both the Life Sciences and Pharmaceutical industries and that the various technologies introduced by Industry 4.0 will soon be part of this collaborative approach. Reliance will be exhibiting in June at SLAS Europe 2018 in Brussels (stand 303) and the BIO International Convention on the UK Pavilion (stand 1333) in Boston, Massachusetts. If you would like to arrange to meet Ruth or another member of the team please email lifesciences@reliance.co.uk. 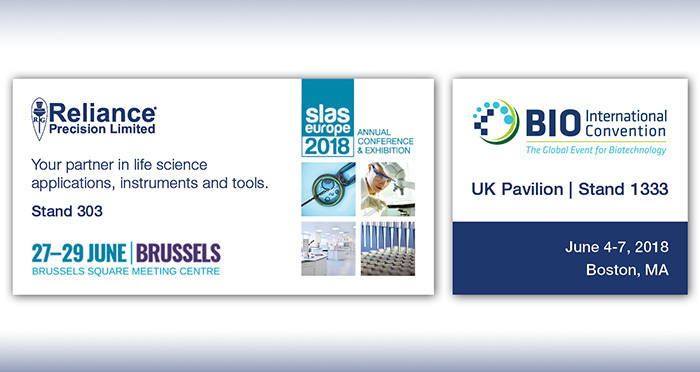 All of the events that the Life Sciences team are attending as both exhibitors and delegates can be found here on our Life Sciences webpage.